Federer has grown into the tournament after his surprise defeat to Kei Nishikori on day one and booked his semi-final berth with an assured 6-4, 6-3 victory over Kevin Anderson. The six-time winner now looks more comfortable on the court after his shaky start and is in confident mood as he continues his bid for a 100th career title. Federer has the marginal edge in career meetings with Zverev having won three of their five prior contests and their last encounter came at this tournament last year when the Swiss nicked a three-set win. Zverev produced a business-like display in his final group stage match as he condemned John Isner to a winless campaign with a straight-sets win and he will relish the prospect of facing Federer. The German showed little sign of suffering from fatigue against Isner - despite alluding to his troubles pre-match - but he will have less than 24 hours to prepare for this semi-final so he will need to recover quickly. The youngster pushed Federer close in their meeting at the O2 last year and has beaten him on a hard court before so there is precedent for success in the Zverev camp. 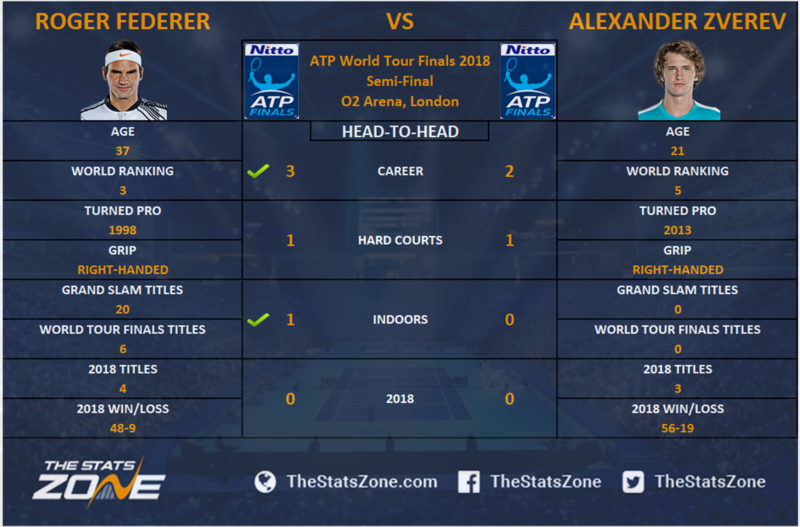 Federer has improved as the tournament has progressed and will go into this as a slight favourite, although he will not be expecting an easy ride against Zverev as the pair have shared some tough battles in the past. Federer will not want to get sucked into drawn out baseline rallies so expect him to force the initiative and come to the net when the opportunity presents itself. Zverev, on the other hand, might be content to slug it out from the baseline and wait for errors but if he's too passive, he could find himself getting dominated like he was against Djokovic. Federer is feeling confident now and is tipped to reach the final, but not without a fight. Federer in three sets.